Two Nitou Kaigan Units appear, that work in tandem with each other to Call and Power Up! 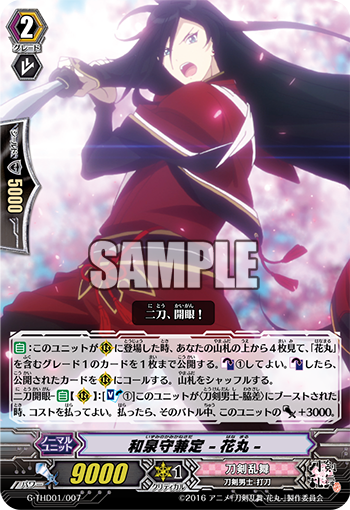 AUTO: When this Unit is placed on (RC), look at the top 4 cards of your Deck, reveal up to 1 Grade 1 “Hanamaru”. You can pay Counter Blast 1 card. If you Counter Blast, Call the revealed card to (RC). Shuffle the Deck. Nitou Kaigan – AUTO (RC): [Soul Blast 1) When this Unit is Boosted by a <Touken Danshi-Wakizashi>, you can pay the cost. If you pay it, during that turn, this Unit gains Power+3000. AUTO: When this Unit is placed on (RC), look at the top 4 cards of your Deck, Call up to 1 Grade 2 “Hanamaru” card to (RC), then shuffle the Deck. If you Call 1 card, choose 1 card from your hand, place it into the Soul. Nitou Kaigan – AUTO (RC): When this Unit Boosts a <Touken Danshi – Uchigatana>, during that battle, this Unit gains Power+2000. For Today’s card, we’re introducing the following cards from the Trial Deck “Touken Ranbu -Hanamaru- Deck Set 1”: “Izuminokami Kanesada -Hanamaru-” and “Horikawa Kunihiro -Hanamaru-“. When “Izuminokami Kanesada -Hanamaru-” is placed on a Rear-guard Circle, you can look at the top 4 cards of your Deck, reveal 1 Grade 1 “Hanamaru” card, then pay 1 Counter Blat to Call the revealed card. If there’s no Grade 1 among the 4 cards, so in that case you won’t have to pay the cost, so that way you don’t lose out. Also, it has a 【Nitou Kaigan】 Skill, in that when it’s Boosted by a 〈Touken Danshi – Wakizashi〉, you can pay 1 Soul Blast, during that battle, it gains Power+3000. Also, when “Horikawa Kunihiro -Hanamaru-” is placed on the Rear-guard Circle, you can look at the top 4 cards of your Deck to call 1 Grade 2 “Hanamaru” card! If you call, you place 1 card from your hand into this Soul. By Calling “Izuminokami Kanesada -Hanamaru-” with this Skill, you can instantly fill out your Rear-guards with their abilities. And “Horikawa Kunihiro -Hanamaru-” also has 【Nitou Kaigan】, in which if it Boosts a 〈Touken Danshi -Uchigatana〉, during that battle, it gains Power+2000! Combined with “Izuminokami Kanesada -Hanamaru-” and its 【Nitou Kaigan】, you’ll be able to aim for a 21000 Power Attack! Today, we’re revealing the complete Card Lists for the cards included in “Touken Ranbu -Hanamaru- Deck Set 1 & 2”! Please also check out here! Please look forward to future “Today’s Card” updates!